The stack consists of two layers, PHP App Server and MySQL, each with one instance. The application stores photos on an Amazon S3 bucket, but uses the MySQL instance as a back-end data store to hold metadata for each photo. Create a new stack—named PhotoSite for this example—and add a PHP App Server layer. You can use the default settings for both. For more information, see Create a New Stack and Creating an OpsWorks Layer . On the Layers page, for PHP App Server, choose Security and then choose Edit. 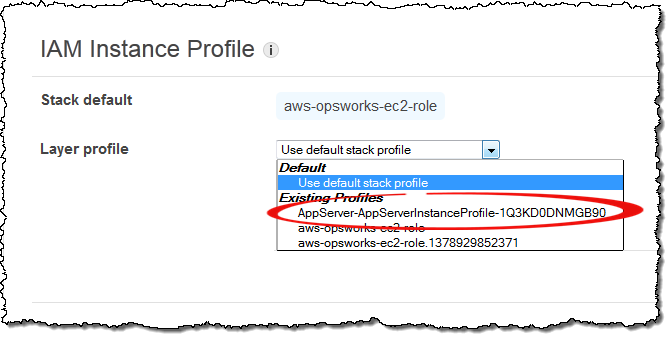 In the Layer Profile section, select the instance profile name that you recorded earlier, after launching the AppServer AWS CloudFormation stack. It will be something like AppServer-AppServerInstanceProfile-1Q3KD0DNMGB90. AWS OpsWorks Stacks assigns this profile to all of the layer's Amazon EC2 instances, which grants permission to access your Amazon S3 bucket to applications running on the layer's instances . Add an instance to the PHP App Server layer and start it. For more information on how to add and start instances, see Adding an Instance to a Layer. Add a MySQL layer to the stack, add an instance, and start it. You can use default settings for both the layer and instance. In particular, the MySQL instance doesn't need to access the Amazon S3 bucket, so it can use the standard AWS OpsWorks Stacks instance profile, which is selected by default.